This is Victoria Crater – one of the places Opportunity spent so much time exploring. 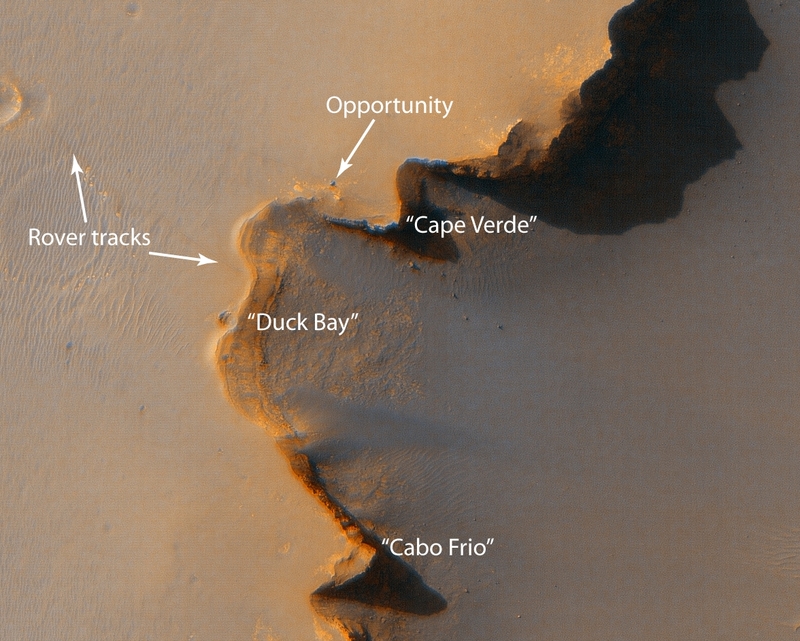 In this big image taken from orbit you can see the plucky rover – if you take the – er – opportunity to check out this legend, you should be able to find it. 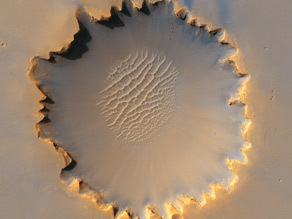 The High Resolution Imaging Science Experiment on MRO - or Mars Reconnaissance Orbiter - is able to resolve objects as small as three feet across. These pictures helped the rover team decide whether a safe path existed for the rover to enter the 2 and a half mile wide crater. so did a safe path exist for the rover to enter the two and a half mile wide crater? The crater picture instantiates an interesting visual effect. Depending on whether the illumination source is at the "northwest" or "southeast", the feature can be alternatively seen as concave or convex. At $4.20 a gallon gas it is hard to be excited by this waste of resources.